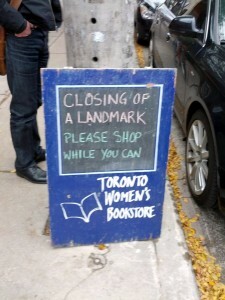 Last Friday, the Toronto Women’s Bookstore opened its doors for the last time. This is an occasion for the kind of celebration and mourning that has occurred in events held in Toronto and beyond. It is also a chance to think about alternative bookstores, change, and remembrance. I became a feminist and an unreliable sort of socialist as a teenager in Vancouver in the 1980s. I remember the handful of co-operatively run alternative bookstores there as spaces of equal comfort, challenge, and community. The Vancouver Women’s Bookstore opened in 1973 and by the 1980s it had moved to Gastown. It had an amazing collection of posters. I would always look at one of a shirtless woman with what I now know to be a mastectomy scar. A few blocks away on Hastings there was Spartacus Books, a collectively-run radical bookstore also established in 1973. To get there you had to travel a long set of stairs that were covered in posters for punk rock shows, meetings, and ads for roommates. It always smelled like mice, dust, and insecticide, and once you made it up the stairs, there was a chesterfield, long before these became a routine aspect of café and bookstore life. It was never just about the books. I found these sorts of places elsewhere. Red Herring Books in Halifax. In the early 1990s I moved to Toronto to go to graduate school, and it was there that I came to anti-racist and queer thought and discovered the Toronto Women’s Bookstore. But soon the co-operatively-run radical bookstores that had sprouted across Canada in the previous two decades began to close. In 1993 the Vancouver Women’s Bookstore shut down and sent its records to the archives. I don’t know when Winnipeg’s Bold Print closed, but the event occurred before I arrived in that city in 1999. Between 2004 and 2009, women’s bookstores in Calgary, Saskatoon, Hamilton, London, and Sudbury folded. In Ottawa, Mother Tongue Books closed earlier this year. In light of this history, the persistence of Toronto Women’s Bookstore for another decade is exceptional. How do we remember and mark these places and the histories they represent? They mattered to me and to others. As a historian, I am someone who spends a worrying amount of time reading badly handwritten letters and reports from the early nineteenth-century, documents that describe a world both very different and very similar to the one I inhabit. My eyes glaze over when people wax romantic about the 1960s, not because the 1960s aren’t interesting or don’t matter, but because they are interesting and matter in ways that can’t be contained in reminiscence. There are new spaces for people to come to feminism, to Indigenous politics, to other sorts of thinking and being otherwise. Many of these are virtual, bastions of sharp minds, good company and genuinely funny remarks amongst the troubling sea of misogyny, racism, and literal and symbolic violence that is so much of the internet. But some of these alternative places are immediate, visceral, and lived. And some of the alternative and radical bookstores that so marked my intellectual and political growing up are still there: Spartacus Books endures in Vancouver, and so does Mondragon in Winnipeg. Things change, and that is not a surprise or a bad thing. Things also stay the same, and sometimes the ideas and practices that motivated these places and made them relevant shift, adapt, and alter their form but not the genuine work they do in people’s lives. So this is a kind of remembrance of the Toronto Women’s Bookstore, but it is also a shout out to the new places that are being built and the old ones that, by hook and by crook, persist. Adele Perry is holds a Canada Research Chair in Western Canadian Social History at the University of Manitoba.